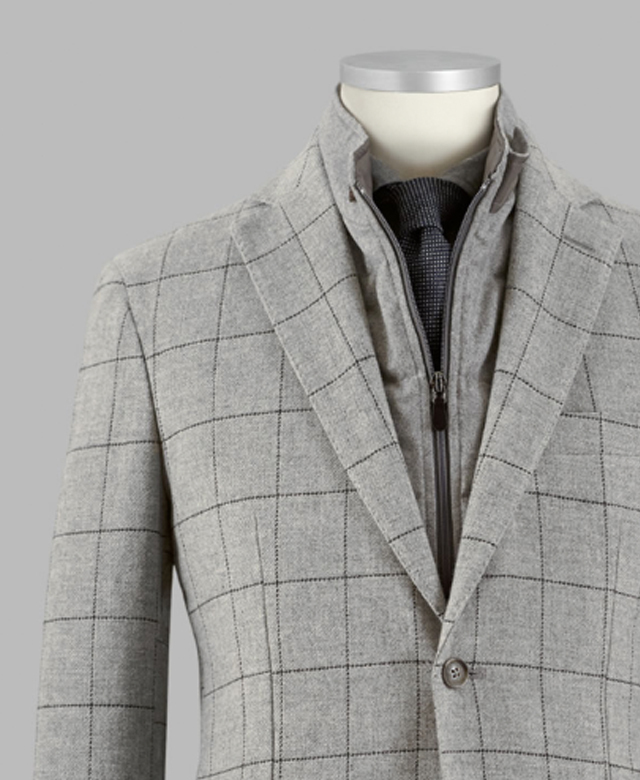 The classic man needs the classic jacket. The hybrid jacket, beyond unique it is a sport coat and we have ours that range our fabrics and and variations in them with Loro Piana fabrics. Making it a nice soft wool and we even have some with the cashmere touch to them as well. A nice night in the city dining out with co workers or friends. Hybrid jackets are a must they have a detachable bib that will zip right out. In the cold and if you pick up the storm system jacket they are wind proof no more need for a scarf wrapped around your neck. Once you are in the restaurant or a meeting unzip out the bib and you have an eloquent sport coat. I know big coats can be a hassle hanging them up at the door that does not even have to happen anymore. The most beautiful things are the classiest. Something that will stay in style no matter universal if you live in Florida you have a sport coat but when you go to New York you have the hybrid. It really is the beauty behind the madness of modern day fashion and the hottest item in our one hundred eleven year business in the fall.